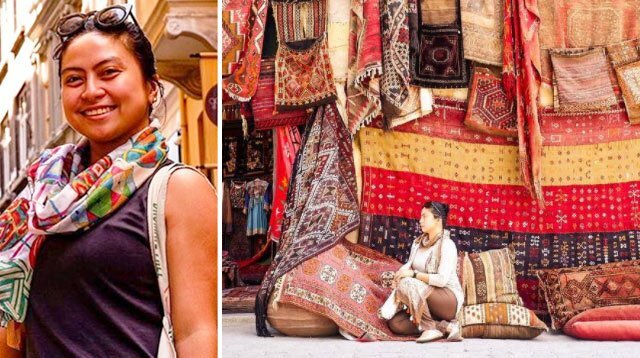 Korea, Japan, or Taiwan might be at the top of your solo travel list, but for 28-year-old Michelle Vibar, it was Turkey. As a senior manager earning P35,000 to P50,000 a month, finding time and building a travel fund for Turkey (along with paying bills and planning other trips) was challenging, but not impossible if you’re determined. What made you decide to go on a solo trip to Turkey? Being an only child, I grew up doing things on my own. I have cousins or friends to share whatever I want with, but even if my family has always been supportive with whatever I choose to do, who would want to go someplace with a travel warning? Honestly, I've always wanted to go to Turkey. When I watched Taken 2, the culture and the people fascinated me. [I also wanted to see] the Bosporus Strait of Istanbul. Imagine, you can get to Europe or Asia in a few minutes just by riding the ferryboat! How amazing! How did you save up for your trip? I usually schedule my trips based on the month I expect a salary adjustment, increase, or bonus. Also, I check the holidays a year ahead to make sure I use my VLs (vacation leaves) wisely. Upon checking the visa requirements, I found out that a valid Schengen or U.S. visa (which I had) makes the process easier and cheaper through an e-visa, which costs about $20 (around P1,000). A few minutes after filling up the online form and paying the fee, I received a confirmation email stating that my e-visa has been granted. After that, I booked my flights. Since I still have other trips lined up this year, I had to make sure to stick to my budget. I realized that I could book in June—that’s when we get our 14th month pay. I checked the holidays for the month. Luckily, there were two, so I just needed to use four VLs [for a seven-day trip]. Yay! [On my chosen dates,] the round trip tickets from Manila to Istanbul were so expensive; so I decided to purchase a round trip ticket from Manila to Kuala Lumpur from a local airline and then fly to Istanbul from there because it was way cheaper! I looked for other deals or discounts. The tour company I booked gave discounts for solo travelers; they offered an additional discount if you paid in cash. I also used my credit card points, particularly in Sultanahment, where I paid P700 on top of the points for two nights—breakfast included—which originally cost about P3,000. I ended up spending just around P50,000 for the week-long trip! What are some of the must-visit spots in Turkey? The water is so clear. Tip: Use your Istanbul card. From Eminönü station, ride your way to the ferry and experience the Bosporus tour. There are hundred of shops to choose from! There are also local bars and pubs you can try. Go to Galata in the afternoon, dine at one of the local bars or restaurants or chill at the rooftop of a café overlooking the Golden Horn. Most of the mosques are located in this touristy area. This is where you’ll find the blue mosque and Hagia Sophia as well as the Medusa at the Basilica. Go to the Spice Bazaar and the Grand Bazaar for shopping. From Istanbul, you may ride a bus to Cappadocia, or you could book a flight from Istanbul to Kayseri or Nev?ehir. Make sure to book your hot air balloon ride when going to Göreme, and ask the tour company if they provide free airport pickup. Check out the cave hotels in Göreme. What did you enjoy most about it? The highlights of my trip were the food and the people. Turkish food is so flavorful. I loved the freshness of their fruits (mostly organic, btw), and their meat and seafood were also amazing—you could even catch fish from the Galata Bridge! The Turkish tea, or the coffee [are also must-try drinks]! And the people? God! They're all so good looking! Did you feel safe traveling alone in Turkey? Absolutely! The people were warm, welcoming, and generous. I didn't know how to speak their language. All I knew was ‘Merhaba,’ which means ‘Hello,’ but most of them know how to speak English (or at least tries). The transportation system was easy to navigate, too. Please respect and observe their culture especially if you're going inside a mosque. 2. For solo travelers, don't forget to bring your tripod. 3. Just take it slow. Walk around, grab some drinks, interact with the locals, watch the people, live in the moment, and breathe. 4. Don't be shy to ask for a free taste! I ended up having to carry almost 20 kilos of Turkish delights and sweets back to Manila because I enjoyed the food so much! Think you'll ever go back? I’m actually thinking of going back there next year to check other places like Izmir and Çe?me or Pamukkale, where “The Cotton Castle” is. Will you do a solo trip again? Yes! Aside from Turkey, maybe next year, I'll go to Jordan and see The Lost City of Petra. Let's see where life takes me!